Saskatoon Farmer’s Market has started a new concept – why not showcase our local food venders through food demos and samples cooked in a state-of-the-art kitchen located right on the premises. Every Saturday and Wednesday chefs from the market and elsewhere will offer a sample of delectable dishes made from produce, grains, meats, and other products found among the market aisles. Today, Chef Eli cooked a feast. Chef Eli traveled the world for 18 years, was chef at Azafran in Spain near Madrid for 7 and a half years, moved back to Canada and became food manager at Joe’s Garage for 4 years in Courtney BC. Lucky for us, he has returned to his home base – Saskatoon. 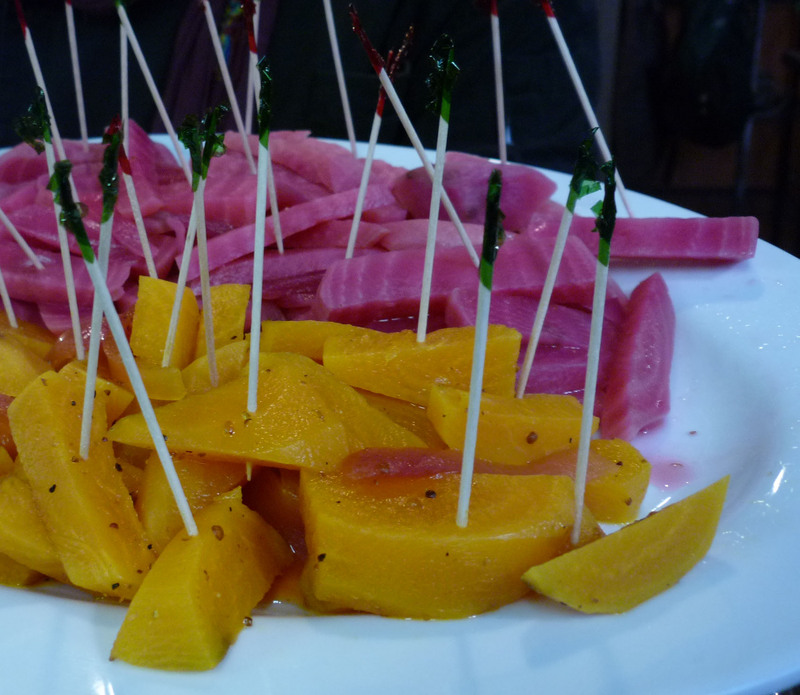 These pickled golden and rainbow beets were delicate and zesty in taste. I want to make these at my next party. 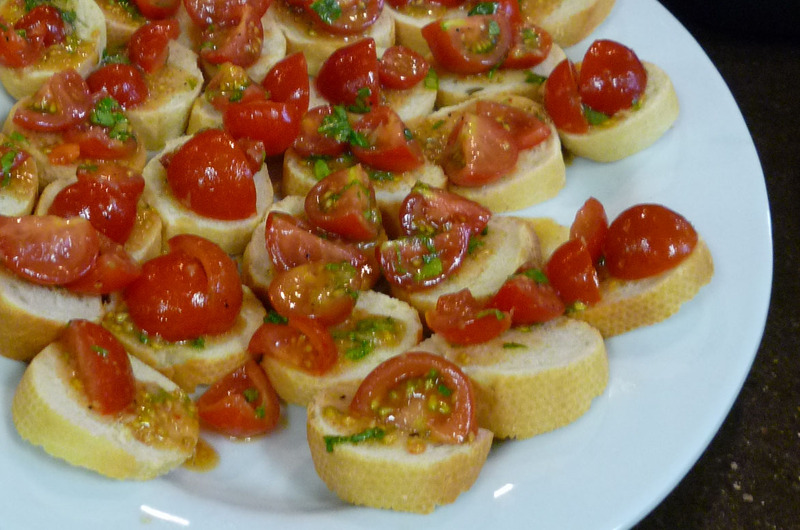 The tomatoes had unbelievable taste. You can’t buy this flavor at a supermarket. 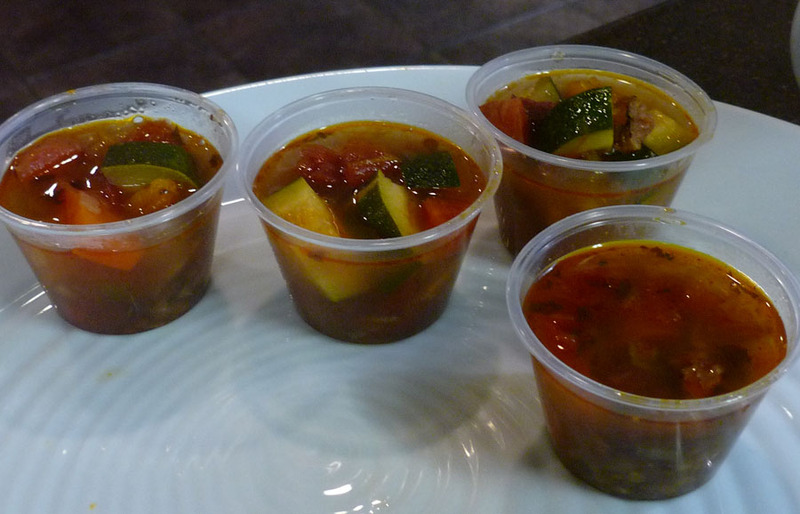 Loved the taste of this soup, especially the boar, it added a wild undertone of gaminess. The broth light and vegetables had a bit of crispiness – I craved a bowl but was teased with a taster. 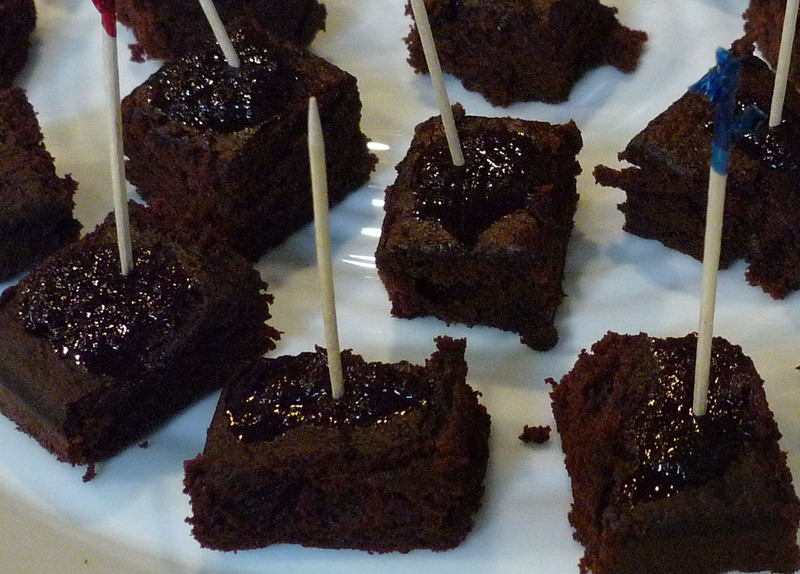 This morsel melted in my mouth and I had a ‘death by chocolate’ moment – so I had 2 more. Other Chef Eli creations included a Beluga Lentil Dip made with black lentils, Tahini (sesame paste), and lots of garlic, plus more enticing ingredients; and a Sea Buckthorn and Mint Yogurt Lhassi (Indian yogurt drink) which cooled my mouth with a wonderful zesty and minty flavor. And yes the yogurt is freshly made and sold at the market. Chef Eli surpassed in his culinary experience. Can’t wait to try more of his scrumptious dishes. Although Eli was the Chef of the day Linda from ‘Super Salsas and Tortillas’ presented tasty morsels. Linda will be highlighted as the main chef at the Agrium sometime in January or February and will have a sampling of traditional Mexican flare. Today she served Pastel Aztec, a take on lasagna using tortillas and chicken. I really think samples have to be larger after tasting this. Also served was her salsa and tortilla chips. All these are freshly made. I especially liked the Ensalada Nopales made with cactus. I’ve never had cactus before and I enjoyed the flavor – almost between a green pepper and an eggplant in texture and flavor. Don’t be afraid to try this – it is delicious. All those samples added up to one delicious lunch. Stayed stewed for more market adventures.